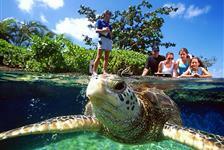 Visit Hawaii’s “Top Family Attraction” – the Maui Ocean Center Hawaii Aquarium! At Maui Ocean Center aquarium, you can view over 60 outdoor and indoor exhibits, such as The Living Reef, Turtle Lagoon, Hammerhead Harbor, and many more. You’ll be amazed by sharks, whales, dolphins, and seals, among other spectacular marine life. For a fun family adventure, order your tickets to Maui Ocean Center now!